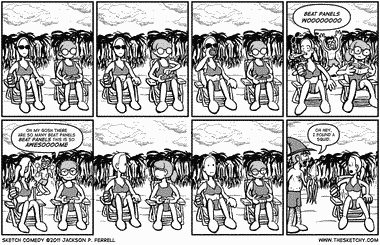 Today’s Friday Five is any five strips from Robot Beach. Go ahead, pick your own five. You can look through the whole archives, it’s cool. Robot Beach is a strip about a robot on a deserted tropical island. Robot has no idea where he came from or how he came to be on the island, but he’s determined to make the best of the situation. He has two friends, Carl the crab and Larry the seagull, and he has humorous gags with them three days a week, until the fateful day when he goes off into the jungle searching for answers about his origins. It’s a clever, well-drawn strip with a good balance between daily jokes and the ongoing storyline, and I highly recommend it.